Two weeks ago was a day when Kopertis organize National University Debating Championship (NUDC) for all university in Yogyakarta. It was started from Mrs. Shinta, the lecturer of Psychology in Proklamasi 45 University, told us that we should join the competition. I said to my self that I was ready to beat them all. And I prepared for my self and my team to increase some knowledges for about 2 months before competition. So we practiced together and read with some motions to talk about. But what was Debate? Debate was Practice of Comparing, and Contrasting Ideas. The debate was not about trying to make the other person look bad. The debate was not about trying to make yourself look good or sound smart. It was about the ideas. And the debate only focussed in the ideas which was in going line in the room where we were in debate background. And it was important to remember that everytime we were talking club or we were out of tournament that we were not really arguments with another person in in that forum. We were talking about the ideas. And that made a lot of unusually thing because when somebody said “I disagree with you”. They did not say, “I don’t like you”. And they said, “I think your ideas you have is wrong and here is reason that your ideas is wrong”. And so it was the same with a football game and I hated the guy in another team. It was not that I did not like him. He was on his team and he was a part of the game. So we had to think of debate in the same way. We were not out to get the other team but war at giving ideas. So that was how it went. The goal of a technic debate was the search for truth. Like I said that we did not fight each other but we were really there to try to find out what was the best answer? And we had a topic and made some arguments. So those arguments there existed in the world. So we should be searching for the truth to find the best answer that we were able to get to for right now. So those of things that what the debate was want to goal. On Friday Mey 17th, 2013. I was supposed to go to kopertis in the morning at 8.30. But I was late because I had a problem with the address to go there and so that, I asked some people to show me how I got there. Fortunately, my friends Anya and Panji were not mad to me. They were on the team with as chosen to represent Proklamasi 45 University. So this day, I was explained about technical British Parliamentary Debate. 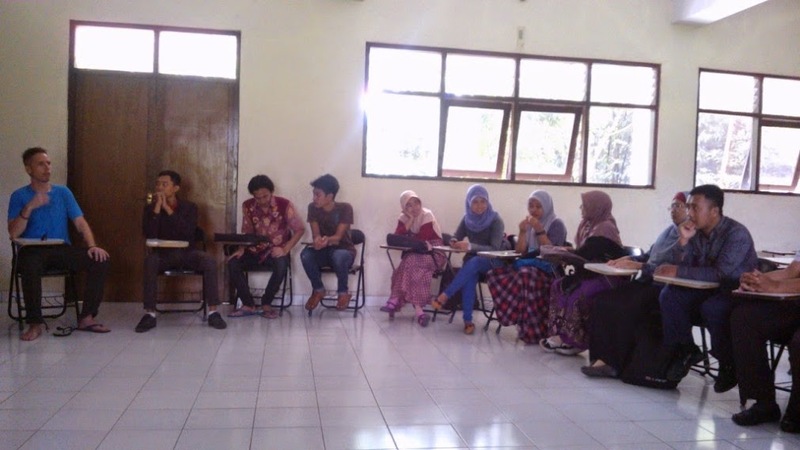 Different debating style are adopted in different tournament. Let me explain before I continue my story. It is well known debating style. British Parliamentary Debate was very widespread, and has gained major support in the United Kingdom, Ireland, continental Europe, Africa, Philippines and United States. It has also been adopted as the official style of the World Universities Debating Championship and the European Universities Debating Championship (at which the speakers are given only fifteen minutes' notice of the motion). Speeches are usually between five and seven minutes in duration. The debate consists of four teams of two speakers, sometimes called factions, with two teams on either side of the case. Because of the style's origins in British parliamentary procedure, the two sides were called the Government and Opposition, while the speakers took their titles from those of their parliamentary equivalents (such as the opening Government speaker, called the Prime Minister). Furthermore, since this style was based on parliamentary debate, each faction was considered to be one of two parties in a coalition. They must therefore differentiate themselves from the other team on their side of the case in order to succeed in their own right. All speakers were expected to offer Points of Information (POIs) to their opponents. POIs were particularly important in British Parliamentary style, as it allowed the first two teams to maintain their relevance during the course of the debate, and the last two teams to introduce their arguments early in the debate. The first and last minute of each speech was considered "protected time", during which no POI may be offered. Depending on the country, there were variations in speaking time, speaking order, and the number of speakers. For example, in New Zealand, both the leader of the Opposition and the Prime Minister offer a short summary as the last two speakers. I knew about feeling nervous after hearing about this presentation on that day. I felt desperated. I did not even know about how to debate well or just giving arguments as like giving a proposal. When our senior said that they hoped they faced an accident in on their way to go the competition but it was not happen. I got that after seeing this. On Monday Mey 20th, 2013. We were in the hotel near Kaliurang which I forgot the name. in technical meeting on Friday, we were told by committee that we were supposed to come at 7 in the morning and the agenda would be begun at 8. Honesty, although I liked the service and its place, I still felt hopeless after the meeting 2 days ago. I did not expect that they were going to give an example of BP debate in front of the meeting. But life was supposed to go on in order to get up from this nightmare. After a few minutes, committee announced the motion of first round and divided the participants randomly. The motion was Talent Shows Devalue Humans. Four including our university had been divided into the debate in the first round. So this was begun. Fighting without fighting. In the Second round, the motion was Government Should Give Incentive for People who Commute Using Bicycle. The last round was Death Penalty by Public Execution for Terrorist. Every rounds Anya and I discussed about our arguments and what we were supposed to give them to rebuttals. Even it was hard for us, but it was not enough for us. Actually, I felt unsatisfied because I did not get any score even one round. And finally, we had passed 3 rounds of this day. Even we were not too bad in rank but we got a lot of things to be learned. Not only from the competition, but also from the participants who had a good way to debate well in every rounds from 44 universities. At the night, after we enjoyed a dinner from the hotel, the committee gave us an entertainment for closing after the participants passed all three rounds. And they announced who had passed to next round into 16 teams and who would be the winner in next day? On Tuesday, Mey 21st, 2013. We had a breakfast at 7 and next round would be begun an hour. I appreciated and enjoyed staying in the room and the service was nice too. so that I could sleep tight at night. In the last day 16 teams were supposed to pass and went to next round and be divided into eight teams to the semi finals. And be going to be divided again into four teams to the finals. I did not expect that Gadjah Mada University would pass to the Semi Finals and The Finals. But the other team of course had a great skill in debating and giving argument. Universitas Gadjah Mada (Amir Abdul Aziz & Nabila Aghniarizqa) proved to be the king of Yogyakarta debating again after winning the Region VII selection of the 2013 National Universities Debating Championships for the third time in a row. In the final, they outclassed cross-town opponents Universitas Atma Jaya Yogyakarta, Universitas Ahmad Dahlan and Universitas Sanata Dharma. The division of the regions followed the Kopertis system, which was the way private Indonesian universities were regionally monitored. Each of the 12 regions were able to send the best 8 teams to the nationals, which be going to have 96 squads -- 192 debaters and 96 N1 adjudicators. All schools that reach the regional semifinals were eligible to advance to the main championship next month. Besides the 4 schools above, Universitas Negeri Yogyakarta, Universitas Islam Indonesia, Sekolah Tinggi Bahasa Asing LIA and Institut Seni Indonesia Yogyakarta were going to also go to the nationals representing the small but university-packed region.